"Twitter for the Universe: A new way to follow the stars." SkyWatch's real-time event notifications allows astronomers to conduct immediate follow-up observations that are taking place in the Universe. This new field of science will explode once the Large Synoptic Survey Telescope (LSST) is fully operational in 2021. 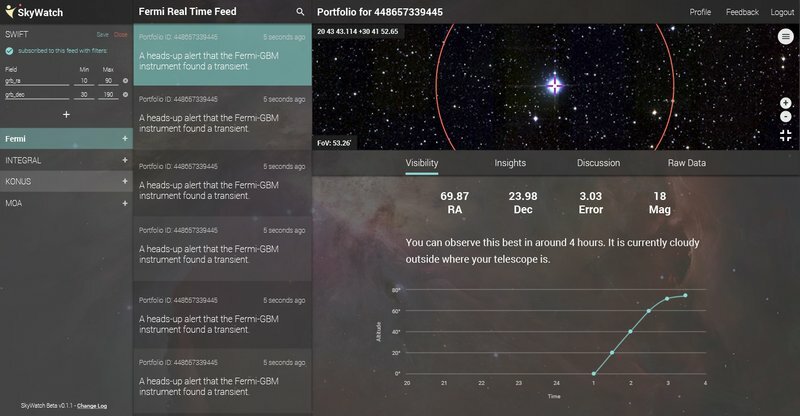 SkyWatch allows astronomers to subscribe to real-time event notifications, enabling them to conduct immediate observations after celestial events. 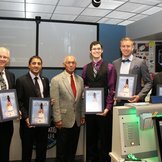 During the 2014 NASA International Space Apps Challenge, the team built a prototypical application geared for use by the general public. The application tapped into NASA’s Gamma-ray Coordinates Network and presented the user with a real-time feed of everything the network was capturing in the Universe. They called it Twitter for the Universe: A new way to follow the stars. SkyWatch was the 2014 Global Winner for Best Use of Data. The team decided to continue to work on their award-winning application. However, in trying to connect new data sources into SkyWatch, they realized there was a fundamental problem in the field. Data sources (mostly outside of NASA) seemed to be siloed; difficult to access; incompatible; and downright ugly. They wanted to fix this, so they formed a company with the goal of becoming the number one source for astronomical data. They understood that it was an ambitious and lofty goal. Nonetheless, if they made a long-term game plan, and worked away slowly and carefully at each problem, there would be an opportunity to at least make a dent. Currently, they are working on tools for time-domain astronomy, the field in which astronomy is studied in real-time and on time scales. SkyWatch currently access NASA data through the Gamma-ray Coordinates Network. They plan to incorporate more data sources into the product this fall. SkyWatch has been in private beta testing since May 2015. SkyWatch consists of lifelong space enthusiasts with a combined 50+ years of software development experience. 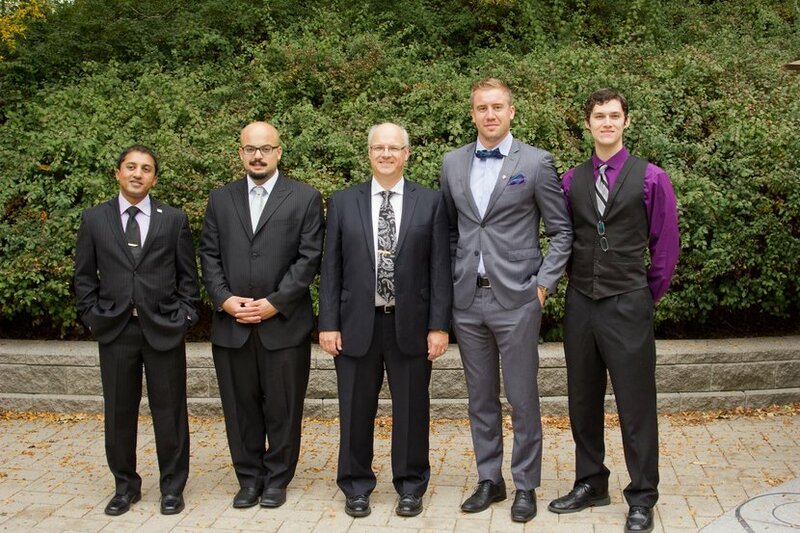 All four founding members contribute to the engineering of our technology. Dexter Jagula is a software engineer with a Masters in Space Studies from the International Space University. He has nearly a decade of software development experience and over 3 years of experience within the space industry. Ryan Ovas is a software developer with a wide variety of technical skills including SQL & NoSQL database design, RESTful API development, Web Application development, Systems Architecture, and product design and management. Roland Sing is a software developer with over 30 years of experience in the industry with companies like IBM, Sierra Systems, and at MDA where he worked on the Next Generation Canadarm. James Slifierz is a product and business development specialist with a wide variety of skills across both disciplines. On the technical side, he has experience in front-end web application development and product management. On the business development side, he has over 3 years of experience working with startups, experiencing fundraising, strategic planning, team building, and operations.